the extra earnings obtained by a producer from receiving a price for a good that is higher than the price at which he would have been prepared to supply. Since producers are not equally efficient in supplying goods, a market price that is just sufficient to induce the ‘intra-marginal’ producer (i.e. the least efficient producer) to remain a supplier will simultaneously result in more efficient producers earning producer's surplus. 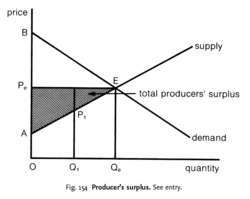 Producer's surplus is directly analogous to CONSUMERS’ SURPLUS and is shown in Fig. 154, where the EQUILIBRIUM MARKET PRICE is OPe. At any point along the segment of the supply curve AE, producers would be willing to supply the appropriate quantity and would receive a greater price, OPe, than the price that they would be prepared to sell at. For example, one producer would be prepared to supply the intra-marginal quantity OQ1 at a price of OP1, although in fact he receives the market price OPe, giving a producer's surplus, P1Pe. The total of all such producers’ surpluses is indicated by the shaded area APe E.
In PERFECTLY COMPETITIVE markets only the most efficient producers are able to survive, and since the equilibrium market price is only just sufficient to cover suppliers’ costs (including a NORMAL PROFIT return), the producer's surplus is zero. By contrast, in imperfect markets such as OLIGOPOLY, the tendency for market prices to be higher than the costs of the intra-marginal supplier may enable some suppliers to secure a producers’ surplus. the deadweight loss (DL) is an effective cost for society or the negative net result defined as the producer's surplus decrease without any compensatory increase for the consumer's surplus. This increase in production of wheat would have generated a gain of producer's surplus of Rs 10682 million. Thus, the sum of price changes times cars sold, or the average price change times total units sold, equals the amount of producer's surplus lost in a competitive market. Proof: Since the expected value of producer's surplus net of cost of entry is zero, the expected value of total surplus equals that of consumer's surplus. where PS is the producer's surplus in the agricultural market, and w is the quantity of water demanded. The paper uses traditional supply-and-demand-curves to calculate the gains and losses to different economic agents in the society in terms of consumer's surplus or producer's surplus.